At Creations by JW Essences, we specialize in 100% all natural skin care products. All of our skin care products are hand crafted from natural herbs, vitamins, flowers, scents, and essential oils. The products we create will leave your skin looking and feeling younger and healthier. Here at JW Essences, our products are 100% all natural, meaning that we use no synthetic ingredients in our skin care recipes. Our natural skin care products are fused with an assortment of vitamins and minerals that will leave your skin with a vibrant glow. All of our products are safe to use on a daily basis and are the perfect complement to your daily skin care routine. "Puffy Eyes Go Away Eye Serum"
"Wrinkles Are Gone, Now Comes Youth"
At JW Essences, we also specialize in special orders. With a wide selection of scents, herbs, and oils, we can create a custom 100% all natural skin care product for you. To discover the benefits of our 100% all natural skin care products, please contact me, Joyce, at (616) 406-6901. Call today to place your order and learn how are products are made entirely from scratch. 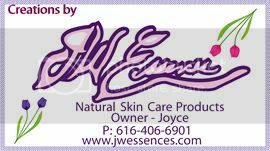 Creations by JW Essences, your source for 100% all natural skin care products.